The rehabilitation of an ‘artist’ and salvation for Weston ? Sometimes, the juxtaposition of two elements creates something that is greater than the sum of its parts. It appears to me, this is particularly true when the elements being brought together are unexpected and wouldn’t be something you would naturally think of in partnership. I think I may have spotted just such a marriage today. The problem is that by their nature it’s nearly impossible to spot the difference between an act of genius and a car crash. From the 1920’s Weston Super Mare in Somerset developed a name as a traditional seaside resort. 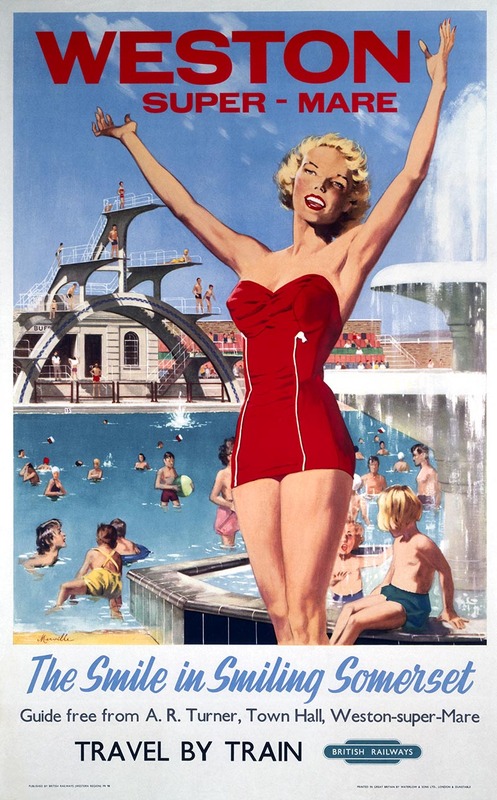 As a resort at that time it had a lot going for it, a great pier, easy rail routes from the industrial centres of Birmingham and Manchester and the warmer climate of the west country. The town even made allowances for it’s rather ‘muddy’ beach (so much so it can rather cruelly be know as Weston-super-mud) by building and promoting a lido. With landladies arguably second only to those of Blackpool and a natural knack for advertising Weston became the west country seaside destination. Under the banner or ‘Weston Super Mare with air like wine’ the town reached its zenith in the 1950’s and early 1960’s. Although remaining a popular summer destination for many, the town has suffered from the rise of cheap air travel and package holidays to sunnier and hotter locations. 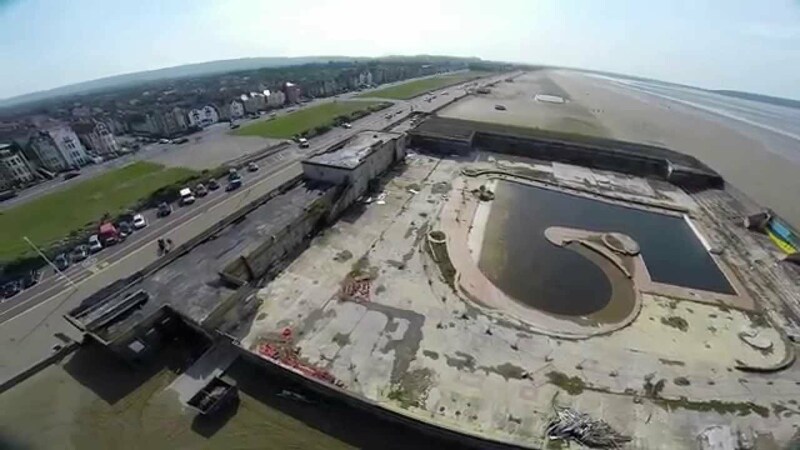 Indeed the reliability (or lack of it) of the British summer has perhaps been the biggest factor in the decline of Weston from those Halcion days, not even donkeys on the beach and a revitalised pier being able to fully compete. As for that lido, unfortunately time has not been kind on what was once one of the jewels in the town’s crown. Gradual decline and disuse has left the building empty and in parts near derelict despite several attempts to revitalise or repurpose the complex into something more useful to the local community. Rebranded in the 1970’s and 80’s the Tropicana became something of a political football with several redevelopment schemes failing to get off the ground for a variety of reasons. In anyone’s books it is a rather sad and bleak shadow of its former self. With changes to local government boundaries, many would argue that Weston has suffered from the continuing rise of Bristol. With that city’s growth and rise as a regional centre, it is Bristol that has grown into the regional hub for business, entertainment and the arts more generally. That said, not all Bristolian artists have been universally acclaimed or even that visible. Odd as it seems, there is a fairly strong history of artists acting counter-culturally and shunning the very oxygen you would imagine they seek – publicity. Stretching back as far as Pope and George Elliot there have been those artists who avoid the attention of the media of their time. 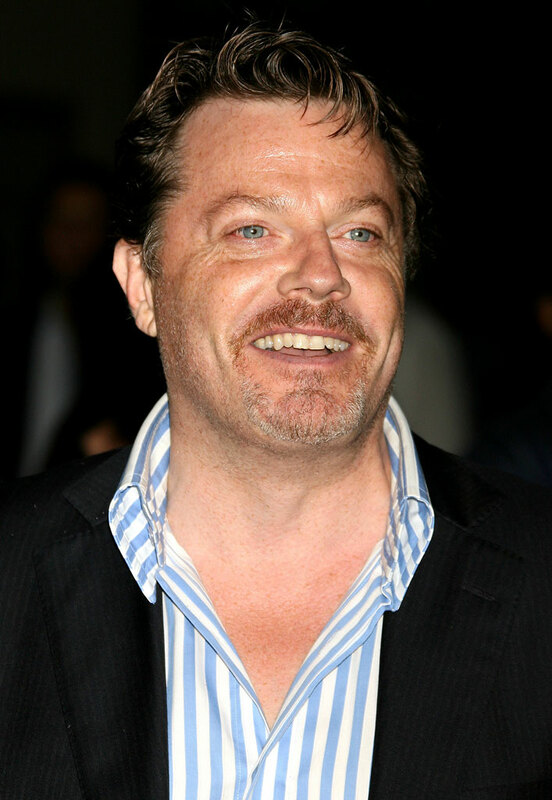 More recently, despite the initial unlikely nature of this relationship, artists such as Euan Uglow, Francis Davison, Michael Andrews and even Eddie Izzard have exhibited the same behaviours. Some appear to be genuinely averse to the attention whilst others may well be benefiting from their natural ability to manipulate the expected norms of modern marketing. 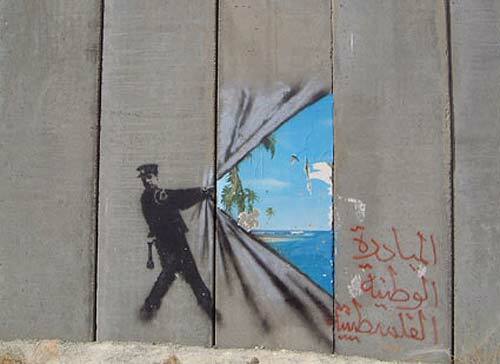 Perhaps the greatest current exponent of this art is Bristol born Banksy. His initial reticence in the early 1990’s may well have been because his early works were often considered to be little more than vandalism or graffiti. He was certainly not welcomed in many of the locations in which his stencilled art appeared, certainly not in those early years in any event. One of the significant differences (with all except perhaps George Elliot) is the fact that Banksy has managed to keep his identity more or less secret since that time.Thought to be Bristol born Robin Gunningham or Robin Banks, speculation still abounds as to his true identity, no doubt adding to his cache and popularity. The answer is something unexpected, bleak, thought provoking and subversive but which those lucky enough to have seen it say is an overwhelmingly positive and uplifting (if somewhat challenging) experience. 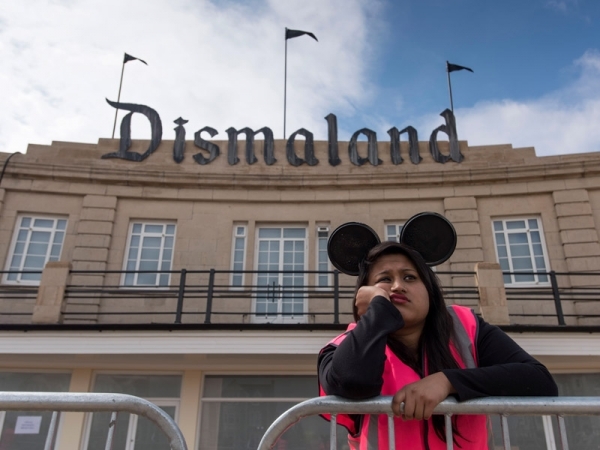 Due to open for local audiences tomorrow and to the wider public shortly afterwards Banksy has collaborated with other artists to create Dismaland. 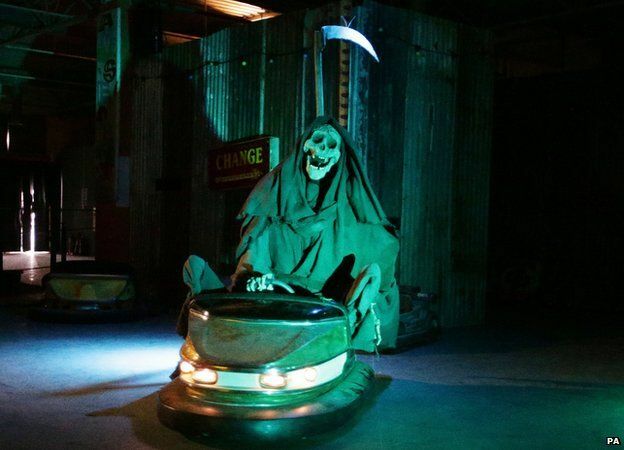 Complete with a very familiar type faced sign and morose volunteers welcoming guests to this bleak attraction this ‘bemusement park’ looks like breathing life into Weston over the coming months as it will undoubtedly draw fans from across the country and around the globe. It will be interesting to see how the notoriously litigious Disney corporation respond to the parody (including ears on the volunteers that look remarkably mouse-like). So is this just a publicity stunt or is there more to this surreal and ultimate in pop-up art culture. 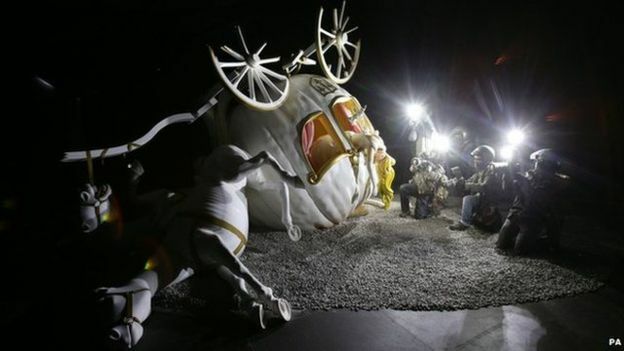 Taking over the whole of the tired and broken Troicana, Dismaland feeds on the atmosphere of entropy and decline with a mix of humorous and the bizarre, political comment and audience participation. Although Banksy isn’t the sole artist, his work and that of Damien Hurst dominate the more challenging and provocative pieces. There is the unfortunate unicorn in formaldehyde (a Shetland pony gave it’s life for a piece I could really have done without) however, Hurst’s fragility of love featuring a beach ball hovering over a collection of sharp knives and shards of glass is both imaginative and strangely touching. In addition to these pieces are works from other artists all with a darkness within their theme but somehow bringing a sense of wonder and tackling some fairly deep and topical issues ranging from immigration to commercialism and environmental issues. Perhaps the most political and subversive pieces is displayed within a decayed and abandoned castle (again a la Disney). In this, a pumpkin carriage is seen overturned in a tunnel with the body of Cinderella hanging from the carriage window whilst being photographed by the gathering paparazzi. No explanation or parallels are drawn and none were needed. However, it was clear that the subtext was all too apparent to those viewing it. This is far from the simple stencils on walls of the 1990’s. As someone who is not usually a fan of modern conceptual art, this collection made me think and respect the thought and effort put into its creation and presentation. Far from a car crash of a marriage, I suspect Weston will once again be the throbbing hub of the west country for the next six months or so. Ironically, this year’s poor summer and the relative decline of the building is exactly what is needed to showcase this most unusual and imaginative collection. Those in the town of Weston-Super-Mare can’t speak highly enough of Banksy and his counterparts. A true rehabilitation of those artists who’s work was washed from the walls years before. It’s unclear at this time where the money which will be raised is going and how much of this might find its way back to Weston. I hope this dark and confronting collection of works brings some brightness and happiness to a town which has had more than it’s share of troubles. For something so initially dark, it is surprisingly uplifting and enjoyable. A strange but productive marriage. ← Will long haul aviation be possible after peak oil?